Predictably, the official guide to the Mission San Juan Capistrano given out at the entrance turnstile concentrates on the history of founder Father Junipero Serra and the history of the Spanish colonization of California. 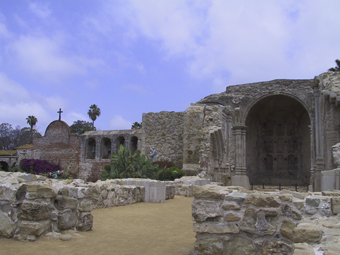 The mission was founded by Serra on November 1, 1776, and soon became one of busiest in the territory. As was the case just about everywhere the Spanish set down roots, the native population was forced to work for the greater glory of God, the Royal Crown, and the free labor they provided. The Indians were actually locked up in the buildings at night. just for stopping by. Evidently, no one has pointed out the inadvertent humor, or it’s just too expensive to repaint the sign. The 1939 hit tune “When the Swallows Come Back To Capistrano” was recorded by Glenn Miller, Gene Autry, and the Ink Spots, but no one has thus far been inspired to sing about the ghosts that haunt this upscale area. Indeed, it would seem peculiar if there weren’t any supernatural phenomena in this town steeped in the history of early California. On the night of December 18, 1812, a catastrophic earthquake effectively leveled the massive chapel, taking the lives of forty worshippers. Even though there are no actors pressed into service to lend the place an authentic air, tourists occasionally report sightings of Franciscan monks walking the adobe colonnades—and disappearing into thin air. Visitors have also heard bells tolling for mass, even though the four massive bells have not been used in years. In addition, ghost hunter extraordinaire Richard Senate reports that a woman in a white dress, looking like she had just come in from the rain that was falling outside, once entered the gift shop, formerly the priest’s quarters. She had jet-black hair and looked “confused and perhaps ill.” When a clerk approached to ask if she needed help, the woman walked straight through a wall. The phantom left no wet footprints. A few doors south of the Mission is the popular El Adobe De Capistrano restaurant, known for its enchiladas, which were often special-ordered by Richard Nixon during his brooding retreats to the “Western White House” in nearby San Clemente. The building was originally two structures, the oldest built in 1797 as a private home. In 1812, the local courthouse was established next door. After the structures were joined in 1910, the place went through a few different owners who began to notice strange goings-on in the basement of the courthouse, which served as a jail. Restaurant employees are wary of the area, which now serves as a wine cellar. They report feelings of being watched, cold spots (in an already cold basement) and wine bottles falling off racks. The Los Rios historical district is a short walk west of the Mission, over the railroad tracks. At least three ancient adobes here have recorded even more dramatic activity than the Mission itself. Under a huge and ancient pepper tree next to the Rios Adobe, the ubiquitous woman in white scares passersby with her ethereal visits, sometimes accompanied by an “evil black dog” who apparently spits fire. One legend claims the unnamed woman killed herself with poison on the front porch of a suitor who had spurned her. The Rios family, who still live in the house, have heard footsteps and doors closing late at night—they used to think prowlers were responsible, but learned to know better after a few tense nights. Dona Polonia Montanez sticks close to her old place next door. She was a popular (if unofficial) spiritual leader in San Juan Capistrano during the late 19th century, and is associated with at least one possible miracle involving a drought-ending deluge. She (or something) manifests as a blue light in her old adobe. Visitors have also heard devout chanting in the two-room home. In 1778, the Mission cemetery was full, so new ground was cleared nearby. 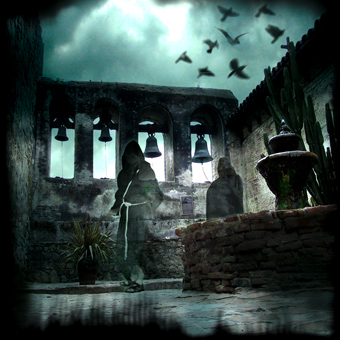 The old and hard-to-find cemetery plays host to a classic La Llorona (Crying Woman) spirit, who wanders the area wailing for her lost children. Almost every area in the southwest originally settled by the Spanish or Mestizos has its own version of this classic haunting, usually employed by Hispanic parents as a cautionary tale to keep kids in line. The cemetery is creepy enough in the daytime and well worth a visit, even though it is gated and locked.